The Siem Reap flooded forests are popular tourist attractions in Siem Reap. Learn more about these forests, their importance and how to visit them below. The Tonle Sap Lake is famous for its floating villages. There are several communities on stilted homes in Siem Reap, Battambang, Pursat provinces. In addition, there are hundreds of houseboat communities living on both the lake and Mekong River, the water source of the Tonle Sap. Each of these floating villages will have a flooded (sometimes called floating) forest nearby. 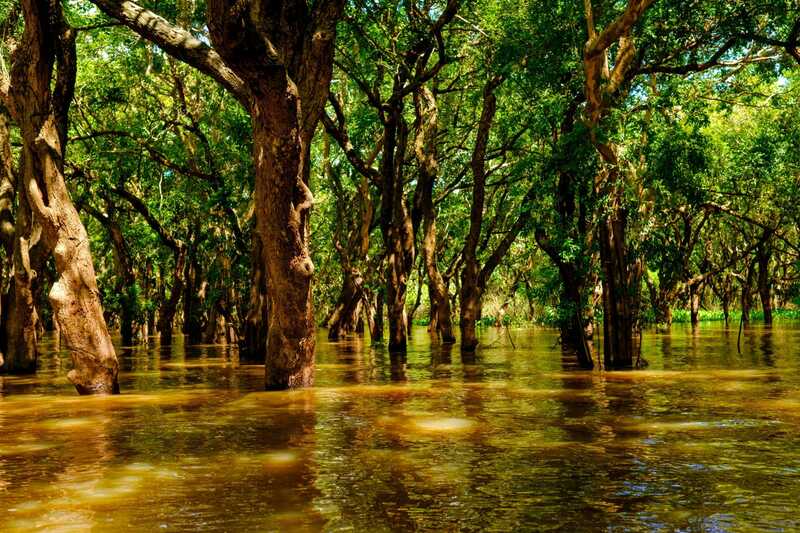 A flooded forest is a collection of dense mangroves that grow on the banks of the Tonle Sap. They are referred to as flooded or floating forests because during part of the year they fill with water. This makes them navigable only by boat. The Siem Reap flooded forests are very important to fisherman as they are rich in shrimp and other fish. They are also a source of wood for cooking. As mentioned there are several flooded forests in Siem Reap province alone. The largest flooded forest is found in the floating village of Kompong Phluk (also spelled Kampong Phluk). Tourists visiting Kompong Phluk will stop at a large floating platform after they pass through the village. From there, you disembark into small canoes paddled by local women. Mechrey Floating Village also has a mangrove forest as well as a nature preserve. This is also located after the village. Guests will be given an option to visit the flooded forest during their trip. Depending on the time of year it can be a great opportunity to see wildlife. Kompong Khleang also has a flooded forest although it is not as popular in general and can not be visited by groups as of writing. As mentioned, the floating forests don’t flood all year around. They are only navigated by boat when the Tonle Sap is filled with water. This usually starts around July and will end the following February. Please note this depends on the floating village and the amount of rain and water the Tonle Sap receives. This will change every year. If you are wondering whether the flooded forest is available, contact us directly. The Siem Reap flooded forests cost different amounts depending on which one you visit. If you visit Kompong Phluk expect to pay 5 USD per person. This includes a shared (2 pax) canoe ride through the floating forest with a local resident. The entire trip lasts about 30 minutes. After the trip you will be asked to tip the driver. We recommend tipping $2.50 USD per person. Please note the 5 USD cost per person is included on a tour with The Tonle Sap Experience. Kompong Khleang has a small flooded forest. Unlike Kompong Phluk, tourists must notify the ticket office they wish to visit the forest. After paying 5 USD per person a canoe with driver will be towed by he community tourism boat. You will then see the flooded forest and return to the community tourism boat to complete your tour. Mechrey Floating Village also has a flooded forest and wildlife sanctuary. It covers an area of approximately 24 square kilometers and can be visited for approximately 10 USD per person (negotiable). If you decide to visit Mechrey we recommend you visit the flooded forest. That’s great Laurie. Feel free to contact The Tonle Sap Experience as they can put you in touch with partner NGO’s that work in the floating villages. Originally from the USA, I have been living and working in Cambodia since 2010. My first visit to to the Tonle Sap was 2011 and I have loved it since. I help with Social Media and General Content for The Tonle Sap Experience. Visiting Kompong Khleang? Read This First!